Apoorva Lakhia’s upcoming film Haseena: The Queen of Mumbai will chronicle the journey of underworld don Dawood Ibrahim’s sister, Haseena Parkar and the first look of the film has left everyone spellbound. Shraddha Kapoor, who is playing the titular role, features on the first poster and she is looking deadly as the Godmother of Nagpada, Haseena Parkar. Shraddha has gone deglam for the movie and her no-nonsense expression will send a chill down the audience’s spine. 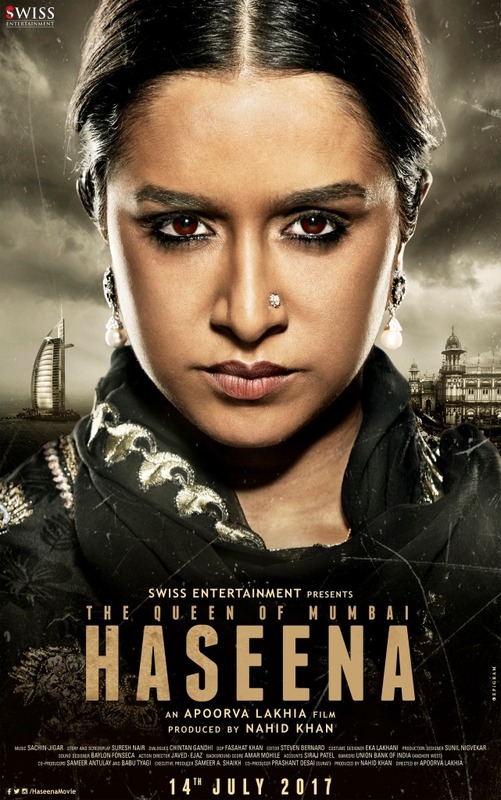 Her kohl-rimmed, fiery eyes speak volumes and she looks menacingly convincing in and as Haseena. The essence of the film has been captured successfully through the intriguing poster, which distinctly shows the glistening Dubai on one side and old Mumbai, which Haseena used to rule, on the other, in the background. Shraddha will portray Haseena’s life from being a 17-year-old teenager to being the 43-year-old Queen of Mumbai. Shraddha’s brother Siddhanth Kapoor will essay the role of Haseena’s brother Dawood Ibrahim.